Literally though, these chicken tinga tacos are the best. B) Imagine how good they taste because juicy chicken, smoky chipotle, creamy avocado, zippy lime, and a charred tortilla just SING together, right? I promise you, they sing. C) Do you have 20 minutes? Cool. You can make these because this is not fancy. 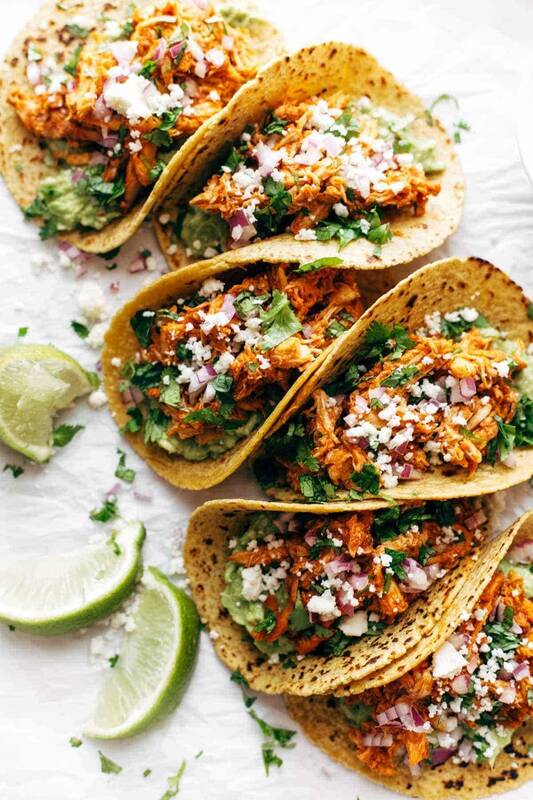 This is just really, really delicious chicken tinga tacos. This is one of those rare recipes that comes together so quickly and somehow still rivals a restaurant-quality meal. 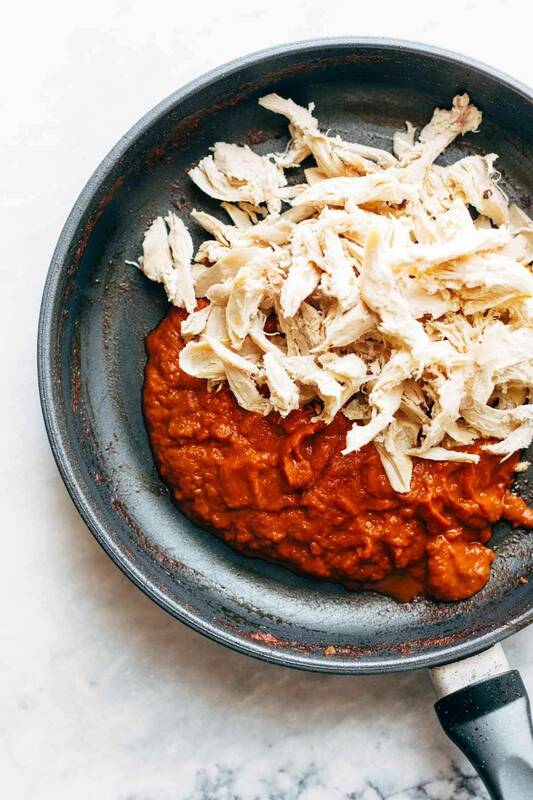 It is a recipe that, once you make it, you say: I will probably make these chicken tinga tacos every time I have friends over because it makes me look fancy with minimal effort. You also say: I need to memorize this recipe. You also say: How soon is too soon to make these again. It is a miracle and a delight. A perfect taco unicorn. Here’s what you do. You take the usual suspects (garlic, onion, spices, chipotles, and some unpictured crushed tomatoes) and you make a sauce out of them. Then you throw your sauce in a pan with your chicken. 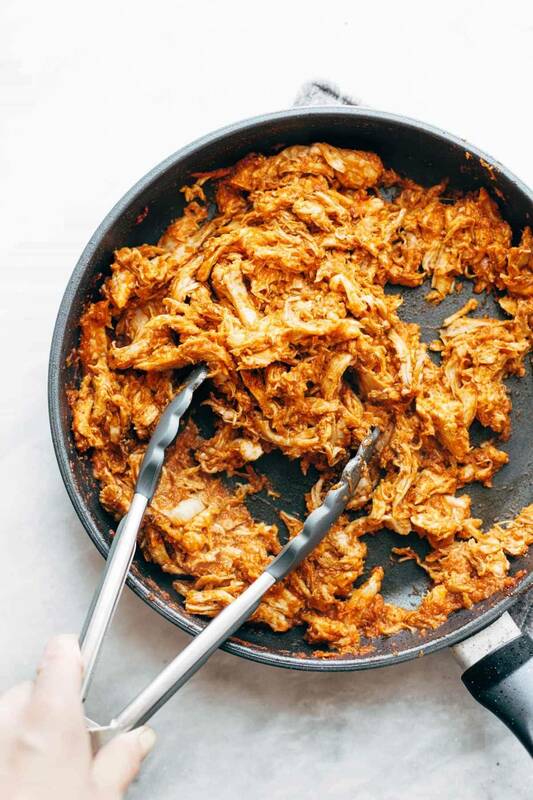 Then you have chicken tinga for your chicken tinga tacos. Avocado is necessary for these tacos (and/or for life?!?! ), so you can either put some chunks of avocado on the tacos as Classy Melissa does in the book, or you can be like me who needs help with messy taco situations and you can just mash up your avocado on the bottom of the tortilla, like a little spread. Pro tip: a little lime and garlic salt in your avocado mash won’t be sad. It won’t be sad at all. Obviously, finally, you will lean hard into those toppings and generously sprinkle cilantro, red onion, and cotija over top to crown each beauty. HELLO LOVER! That was so easy! Can you even with these. 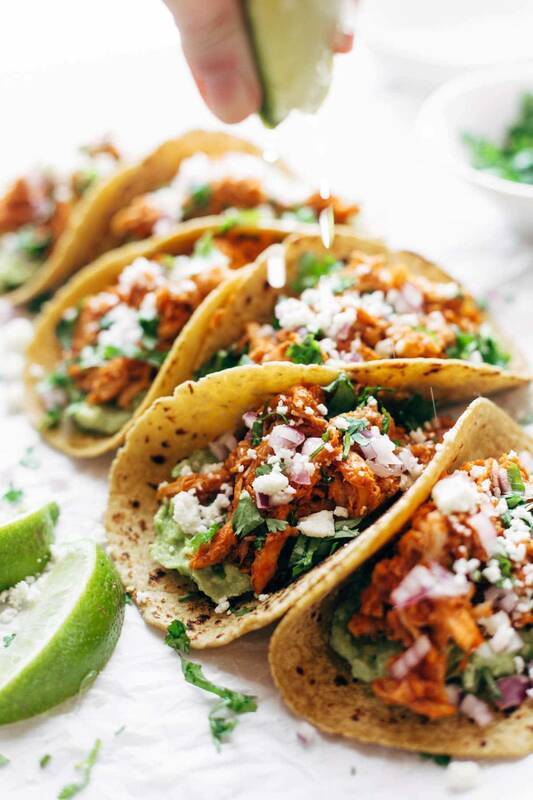 Chicken Tinga Tacos – the only chicken tinga tacos recipe you will ever need! Spicy, saucy, simple, and so fresh. Recipe is posted with permission from The Minimalist Kitchen (affiliate link) cookbook (although I’ve taken the liberty of adding “The Best” as a necessary recipe title prefix). 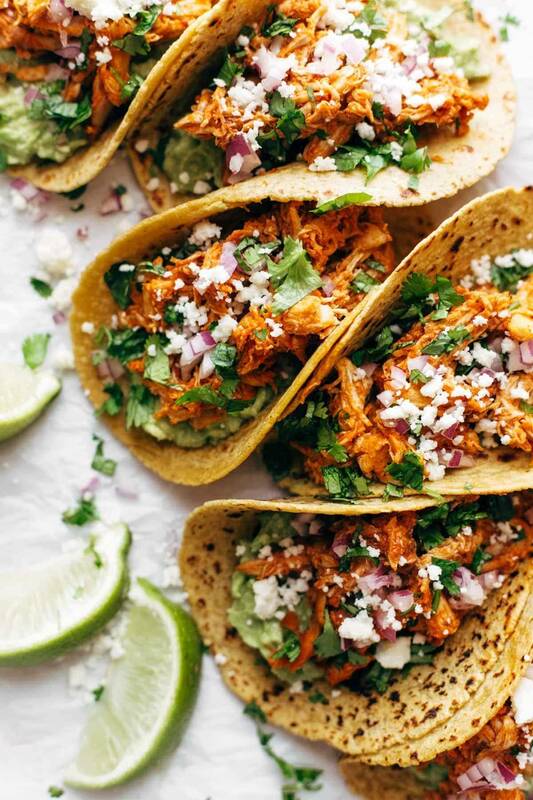 Instant Pot Chicken Tinga Tacos: Blend all sauce ingredients (I did not saute them first). Add sauce to Instant Pot along with about a pound of chicken breasts. Cook on high pressure for 10 minutes. Shred chicken in sauce and serve. 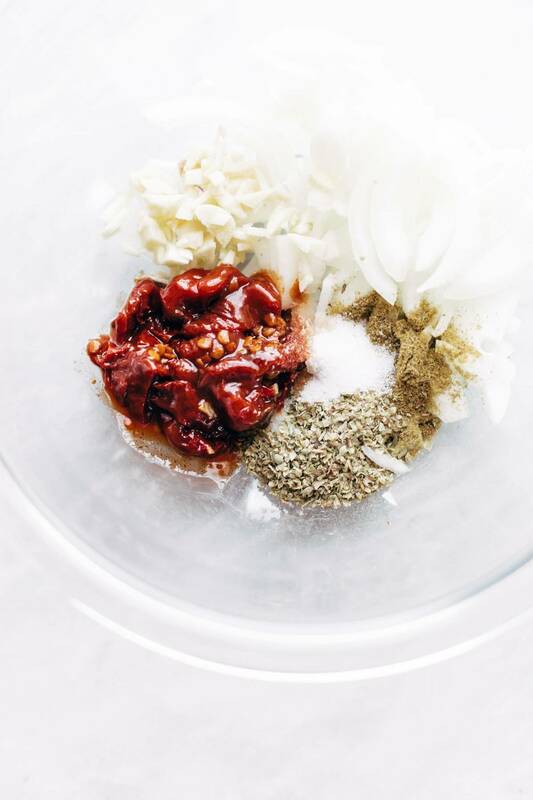 Spiciness: I like to use two chipotle peppers for optimal “medium” spiciness. If you want a mild version, just use one chipotle pepper. If you want it hot hot hot, go for three. Avocado Mash: I found my avocados sliding out of the tacos because I am a taco monster and things got a little messy. To make sure I got every ounce of avocado goodness possible, I mashed up the avocado, squeezed in some lime juice, sprinkled in some salt and a super light dusting of garlic powder, and spread that on my tortillas before adding the chicken. 0 Response to "The Best Chicken Tinga Tacos"